A recent car accident in Dorchester left three young motorists dead. The early morning accident happened just before 5:00 a.m. as three motorists headed north on Morrissey Boulevard. According to local firefighters and Massachusetts police officers, emergency responders tried to save the motorists, two 19-year-olds and one 20-year-old, after the accident left them trapped in their vehicle, which had flipped over. Two died at the scene of the accident and one died later at the Boston Medical Center, according to 7NEWS. “It’s the scariest thing to find out — one day you talk to them and then the next day they’re gone. It’s devastating,” said Amanda Hines, a cousin of one of the victims. As we recently reported on our Boston Car Accident Lawyer Blog, this time of the year is a dangerous time for teens to be on our roadways. It’s this time of the year when teens flock to our roadways to attend prom, graduation and set out on summer break. Parents and guardians are urged to talk with the teen drivers in their family to help to make sure that these young drivers are keeping safety as a top priority behind the wheel. Following the recent Dorchester accident, state police are working with reconstruction experts to try to figure out what exactly happened and how the vehicle ended up how it did, flipped over — entrapping the young motorists. So far, experts know that the car was heading north on Morrissey Boulevard right by Pope’s Hill, but veered off the road between two guardrails. After that, experts believe that it rode up a hill, flipped over and ran into the concrete abutment of a bridge. Dave Procopio, a Massachusetts State Police spokesperson, says that officials with the department haven’t ruled out any causes yet. He says they’re looking into speed and where the young motorists were coming from. According to preliminary investigations, it appears that the motorists were attending a party in Boston earlier in the night. 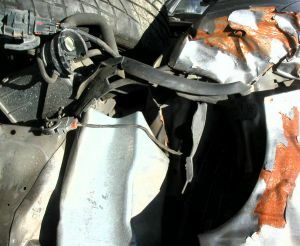 Police have been able to conclude that none of the motorists were buckled in at the time of the accident. One of the passengers was ejected from the sedan in the accident. Mile for mile, teens are involved in three times as many fatal car accidents as older drivers. These accidents take the lives of roughly 3,000 teens every year. This young age group of drivers has the highest proportion of distracted drivers involved in fatal crashes. According to the Centers for Disease Control and Prevention (CDC), drivers ages 15- to 24-years-old represent less than 15 percent of the nation’s population but account for nearly a third of the total costs of auto accident-related injuries. Boston Injury Lawyer Jeffrey S. Glassman offers free and confidential appointments to discuss the rights of victims and the families of victims. Call 877-617-5333 today to schedule your appointment.